Many consumer devices (set top boxes, routers, media centers) use lightweight embedded web servers as user interface. In this walkthrough, I’ll show you how to install a complete web server in a Raspberry Pi, which is a cheap ARM-based computer that is perfect for prototyping such appliances. In embedded systems, we aim at minimizing computational expenditure. Therefore, we’ll use Lighttpd as the web server, and SQLite as the DBMS. For server-side scripting, we’ll use PHP, a nice framework for protyping : easy to learn, and very popular. I’ll start from scratch, with a fresh Raspbian system. This is not strictly necessary : you can probably succeed from any working Raspbian installation. You can start by downloading the Raspbian image, and installing it into the micro SD card. There are different instructions for Linux, for Windows, and for OS X.
Repeat that command for each partition in the device. Now for the dangerous command. We will use the low-level copy command dd, using the disk image as input, and the SD card device as output. Take a deep breath and check each character thrice before hitting Enter, because overwriting the wrong device will be a nightmare. This might take a while — in my system, 5 minutes or so. You may type ctrl+T to send the SIGINFO signal, and get an status update. Also, you might need to write bs=1m as bs=1M, depending on the version of dd. This is it ! Eject the the card. Time to move to the Pi. 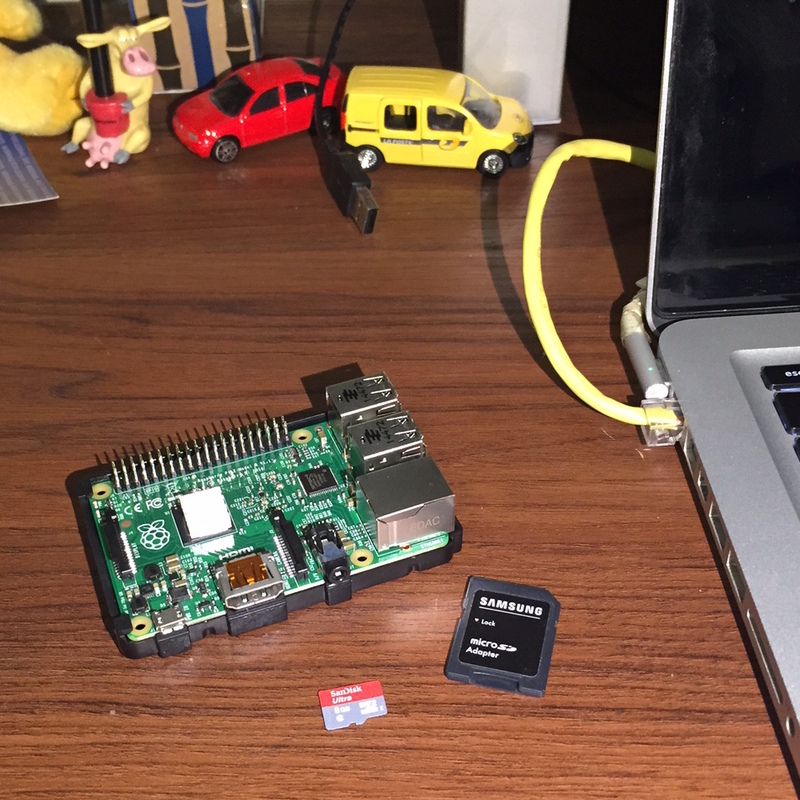 Insert the newly formatted SD card into the Pi, plug the needed devices. We will need at least : an ethernet connection to the Internet, a keyboard, and a monitor. Plug the power last. Be sure to at least activate option 1 (“Expand Filesystem”) so Raspbian will use the entire SD card. Otherwise the upgrade commands below risk running out of space. I will also use option 2 (“Change User Password”) to make access to the system secure ; option 3 (“Enable Boot to Desktop/Scratch“) to ensure that the system boots to Console Text (no need for graphical desktop in this small web server) ; option 4 (“Internationalization Options“) to configure my keyboard to US International; and option 8 (“Advanced Options“) to set the hostname, and to ensure that SSH access is enabled. Once the system reboots, log in (the default user is pi, and the defaul password, if you didn’t change it with option 2 above, is raspberry). Time to install the components of the web server. The instructions are adapted from smching’s Instructable. Finally, we need to set up the permissions of /var/www (the root of the web server), and include the default user on the group that can read/write that directory. Time for a reboot ! …showing that the IP attributed to the Pi on ethernet is 10.0.1.7. You can type http://10.0.1.7/ on the browser of another computer to check the web server. You should see the placeholder page for Lighttpd showing that the web server is correctly installed. Also — if you haven’t disabled SSH — you can type ssh pi@10.0.1.7 to access the Pi remotely. This is useful if you have a single set of monitor/keyboard/mouse. If the Pi is your only computer, you can start the graphical desktop with the command startx, and then navigate to the newly installed web server. Typing the IP address of the machine, as before, will work, but so does using the loopback interface : http://127.0.0.1/ or http://localhost/. Then, type in your browser http://10.0.1.7/test.php (change 10.0.1.7 for the actual IP of your Pi, or use http://localhost/test.php if browsing from inside the Pi). You should see the PHP info page. The raspberry pi is perfect to prototype a small appliance with a web server as interface. If you get an ugly error, like "General error: 14 unable to open database file", double check the permissions of /var/www (and everything inside it). The user www-data must have reading and writing permission on everything (see the section "Setting permissions" above). Otherwise, you are ready to start working on your project ! This is something that was making me crazy : getting multiple copies of a page into a single sheet in OS X — think of small fliers or business cards. The problem was particularly annoying in Adobe Creative Suite (Illustrator, Photoshop, InDesign), where I hoped (in vain) to find an option to do it easily. The straightforward solution (asking on the system Print dialog for multiple pages per sheet, and then asking for multiple copies) doesn’t really work. The answer is as simple as Columbus’ egg : convert the document to PDF, duplicate the pages manually, and then ask for multiple pages per sheet. It works like a charm ! Edit 8/dec : there’s a simpler procedure than the one explained above. Once you open the PDF in Preview, don’t duplicate the pages, and choose the number of Copies per page on the Preview tab (not the Layout tab) on the Print system dialog. I would have completely overlooked this if it weren’t for a helpful YouTube commenter, who also suggests that you can avoid the intermediate PDF step in Microsoft Word by, for example, putting “1, 1, 1, 1” in Page Range (Copies & Pages tab), and then selecting 4 Pages per Sheet (Layout tab). Macro programming is hell. Abuse the preprocessor and soon you’ll be joining the ranks of the fallen in the Turing tarpit. Found out ? No ? First hint : although GCC is technically right and there is a problem in the line shown, it would be much more helpful to show another (symmetrical) error. Still nothing ? There is no shame : the macro parameter msg used with the # operator in line 87 was not declared in line 79. Now imagine ferreting the little troll, among a flurry of cascading errors, from a 150-line source that includes 5 other headers. Maddening enough for a Pirsig treatise. Ironically, the error occurred whilst I prepared a common header for my unit testing modules. As a scientist who mostly writes hundred-line scripts, this is the very first time I am designing unit tests. I was worried that the learning curve for a testing library would be steep, and so I was immediately sold by the no-frills proposition of Check, a unit test framework for C. It comes complete with a tutorial that — frankly — if you are an academic programer like me, tells you everything you need to know. (Although I find the diff notation of the examples less friendly than it could be). Include automatically the main() function — which is very much the same for every test. I took the opportunity to make it parse the command-line to set the verbosity of the output. Below you’ll find the fruits of those amendments. Or if you prefer, here’s a link for the source repo. It is released under the same LGPL 2.1 license as Check. No warranties : if you choose to use it, and your computer turns into an Antikytherean device, or your code opens a portal to Baator, I am not liable. printf("usage: [test_executable] [verbosity flags: -(-q)uiet | -(-m)inimal | -(-n)ormal (default) | -(-v)erbose | -(-e)nvironment ]\n"
Case study : you have an hour-long education video that you want to upload to your YouTube channel. The video needs minor editing : (1) trimming and eliminating a few portions; (2) splicing-in another short video; (3) maybe normalizing the sound. Use Quicktime X Player (bundled with OS X) — contrarily to what “player” would suggest, Quicktime X gives you recording abilities, and very minor editing abilities, like trimming and gluing takes, without having to reencode the video. Sounds perfect, no ? The trimming feature is, however, practically useless, since it has very poor resolution (what is the use of editing if you’ll end up having people being cut in the middle of a utterance ?). And you cannot remove inner portions of a video, just trim the edges : although you can go around this by trimming and gluing several times, for very large videos, it quickly becomes annoying. Use Quicktime 7 Pro (US$ 30 on Apple Store US) — the old version of QuickTime has much finer trimming abilities, and it will allow you to remove inner portions of videos. Free trumps bought any day, but the price is not bad, considering the time it could save. (What really ruffles my feathers is that Apple is basically selling you abandonware 30 bucks-a-piece, but Apple’s greediness shouldn’t really surprise anyone by now.) After you go through all the hoops to find out how to install QT7 on OS X Mountain Lion or Mavericks (it does not work if you don’t get exactly the right version), you find the deal breaker : it is not available in Apple Store Brazil, and Apple Store US does not accept foreign credit cards. Use Avidemux (Free as in speech, and as in beer) — Jackpot ! This open-source project is meant to solve exactly your problem : make minor editing on videos without having to reencode the whole thing (although it has advanced reencoding abilities as well). Installing it is a bit of a hassle : you do all the clicks and have no sound on output. Some googling tells you that the problem is a preferences setting, but you can’t find the “Preferences” panel because a freaky bug has blanked out most GUI elements, including most of the menu items. One hour later, you finally have sound (having found out which blank menu item is “Preferences”, and which blank tab is “Sounds options”, and which blank field is “Sound device”). All that to find out that the preview window has a time delay on the play/pause/ff/rev buttons that makes it completely useless for precise editing purposes. Use ffmpeg (Free as in speech, and as in beer) — Video editing on the command-line : you may be an Apple user by choice, but even for you there is such a thing as too much masochism. Use Final Cut Pro (US$ 300 in Apple Store US), Adobe Premiere CC (US$ 30 per month for Teachers and Students in US) — In order to cut and paste video pieces. Are you kidding ? And I didn’t find a solution ! In the end, I sucked it up and went with iMovies. Grudgingly. Computer Users, we have to do something about this play : this is neither safe, nor sane. But Computer Industry, if you are hearing, this is definitely not consensual. Update 13/dec : A typo in the link for my YouTube channel was misdirecting people to the fake tiniurl URL shortener, instead of the real tinyurl. My bad. Update 18/dec : The story is, unfortunately, not over. Now iMovie refuses to generate an output with a mystifying “error 49” that, according to a Google Search, might mean everything and the kitchen sink. I’ve reverted to a rough editing with Quicktime X and got an output… without audio. I am arriving at the conclusion that I should give up IT entirely and move to the country to raise pigs. This whole “computing” idea should just be filed as “tried, did not work”. Update 19/dec : apparently, iMovie and Time Machine don’t play nice with each other — which is one of the possible causes of the error 49. Unless you are rendering very short videos, it is better to disable Time Machine (click on the Time Machine icon on the notification bar — upper left corner — then “Open Time Machine Preferences”, then switch the big “On/Off” button. Remember to turn it on again once the Finalization or Export are over !). This worked for me, but it is no guarantee to make the pestering error disappear. Oh Linux, you’ll never give me a boring weekend, will you ? For the 100th time in my life I am installing Ubuntu in a machine — in my MacBook Pro this time. Since it’s the third year of the second decade of the third millennium, I was expecting a dull “plug and play” procedure. But it came as a nice surprise that Linux is still a wonderful unpredictable adventure. You never know whether installing your wireless card will take seconds or hours; whether or not upgrading your graphics card will result on a bricked system; or whether or not you’ll end the day throwing your computer out a window in frustration. Just kidding — you know for sure that installing the wireless card will take weeks, and that you’ll end up throwing yourself out a window. Maybe I forgot to click on some half-hidden checkbox when I’ve installed it, but I’ve found out that my Mathematica 9 copy was working only for one of the users in my MacBook. That is annoying, because I keep separate users for my everyday usage, and for giving presentations and classes (so there is zero risk that one of my friends suddenly appears on Skype telling a dirty joke in the middle of a presentation to the Schools’ president). But I’ve found out the problem is easy to remediate. There are three folders where Mathematica 9 searches for the license files : $BaseDirectory/Licensing, $InstallationDirectory/Configuration/Licensing, and $UserBaseDirectory/Licensing (open a new Mathematica notebook and type the commands $BaseDirectory, etc. to find out exactly what the paths are in your system). Sure enough, mine was in $UserBaseDirectory/Licensing — meaning it was accessible by just that user. I don’t know if this Mathematica single-machine/multi-user license problem (or solution) applies for systems other than Mac OS X — if you find out, I’d be glad to know. Hard-science scholars are strange people, who insist on using TeX because it “typesets beautifully”, but then forget to check badness warnings, letting the lines spill beyond the right margin. I have resisted TeX as much as I could, until I finally caved to peer pressure. Still, I only use it for cooperative work : when all by myself, I want something, let’s say frankly, less Jurassic. Still, I am forced to envy my frozen-in-1975 colleagues, when I find out that saving to PDF, an operation that the industry should had gotten right by now, turns my 1 MB Microsoft Word file into an 80 MB PDF-zilla. I’ve spent a good part of my morning solving that problem, considering both the official solution, and more independente initiatives. The official solution flunked when I’ve found out that Adobe had no trial of Acrobat for Mac (am I really willing to spent US$ 500 just to find out whether or not it’ll do what I want?). I tried a PDF compression solution, PDF Shrink, which reduced my PDF… from 89 MB to 87 MB, while mangling horribly all the images: not exactly worth the US$ 35. I’ve also tried recreating the PDF from scratch, but PDF Studio, at US$ 125, just refused to open the Word file with a cryptic ‘error reading’ message. I was glad both were in trial. In despair, I continued searching the Web. Lots of users crying “Large PDF !”, “Word PDF too big !”, “Huge PDFs on Mac !”, but very few answers. Industry, why u no listen ? They say that we should never attribute to malice that which can be explained by incompetence. But Hanlon’s razor notwithstanding, I couldn’t avoid drifting into conspiracy theories. What if that horrible implementation of PDF conversion was not completely accidental ? That is, using only tools already present in OS X, and three small steps, I’ve got an almost 18x smaller file. Risking joining the ranks of the ‘moon hoax’ lunatics, I smell something rotten in the current state of PDF conversion implemented by Word–OS X.
Incidentally, I’ve found something I also needed : how to password-protect PDFs. I was ready to buy a solution, but I’ve found that unnecessary. When creating a new one, on OS X, you can click on the “Security Options” menu of the “Export as” (“Save as” in older versions) dialog — how come I’ve never remarked that one ?. If the PDF exists already, you can open it with Preview, go to File… Export… (File… Save as… in older OS X versions), and check the box “Encrypt”. Two textboxes below let you put a password. Save the file and it will be only visible after the password is entered. EDIT 28/02/12 : I am finding out that the above method is by no means foolproof, i.e., it doesn’t work for every kind of PDF. In particular, I tested it for PDFs generated by PowerPoint, and it backfired (PostScript conversion generated a file much bigger). For image loaded PDFs from PowerPoint, contrarily to the mainly textual ones from Word, I’m finding that the usual tip of using the Quartz Filter (open the PDF file with Preview, then File… Export… [File… Save As… in older OS X versions], then select “Reduce File Size” on the Quartz Filter field in the dialog) works quite well. Buy me ! Upgrade me ! Register me ! It had happened just once before, but now that Parallels (the virtual environment of choice for Mac users) has launched its version 7, trying to use it is a constant source of irritation. Every other time I open the application, I am greeted with a huge colorful popup ad prompting me to upgrade. The “do not show me this again” checkbox is basically useless. I asked it politely to refrain from soliciting, to no avail. I remember when shareware was a novel concept, and I used to download it by the dozens : nagging screens were part of the deal, something to be expected until you paid for a registered version. Since when those “features” have become cricket for bought wares ? After wondering if I should open a support ticket, I’ve just reported the pestering behavior as a bug. Lets see if the development team will agree.